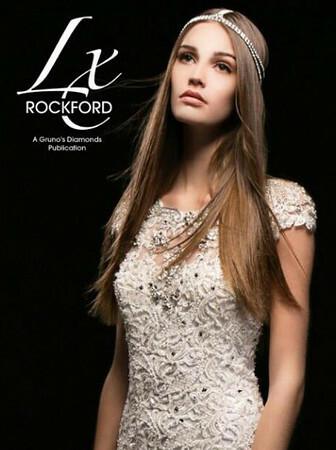 Not too long ago I was commissioned by LX Magazine to do a bridal fashion shoot. It was a great experience, partially because they don’t normally do bridal work and run their artist spotlight “Behind the Lens” features infrequently. After having worked with LX before, the beautiful and talented Loni Hale recommended me, leading them to approach me about the project. The shoot they followed me through was a fun, all day affair of dresses, glamor, and feathers, and you can see the results in the images below. What you see are the actual spreads that were printed in the magazine. You’ll also find a transcription of a the published interview, and after the spreads you can read parts of the interview that weren’t included. LX: The images have a very definite look and feel to them. Even if one didn’t know you shot them all, it’s readily evident the same photographer did. In other words, you have a clearly identifiable style. How did you develop it? How has it evolved since you began photographing? 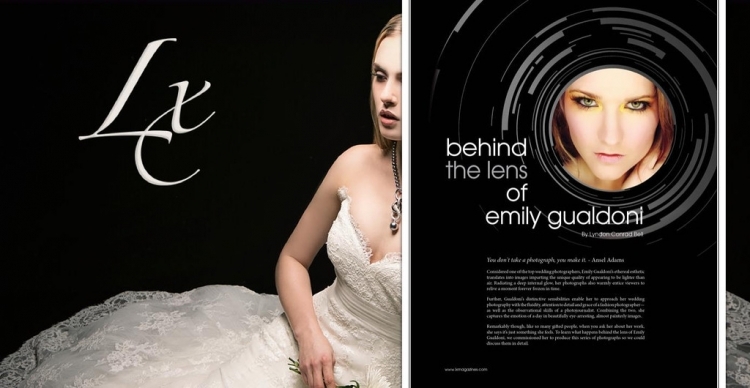 Emily Gualdoni: I’ve always had this in me. Over the years I’ve just been fine tuning it. But, having said that, I’ve never been a very “technical” photographer. I do things intuitively, which I suppose gives me more of a distinct style.I want someone to look at my photography and see pieces of art without focusing on the elements of the image. I feel I’ve accomplished a successful shoot when someone can look and think; “Wow, that’s just beautiful.” and maybe not even be able to explain why. I’ve always found it fascinating when you look at an image and have to wonder if it’s a painting or if it’s a photograph. I incorporate this into my efforts first by creating beautiful lighting and then polishing the resulting photos with a clean—but light—edit. LX: This work is quite striking. It’s like the images are black and white—but in color. Did you see that before you did the shoot? E.G. : Contrast was one of my main ideas when putting together this shoot. I really wanted the beautiful gowns to pop out, but while remaining very simple and elegant. I think it makes these photographs more fascinating when, at first glance, you think you’re looking at some black and white photos. But then, when your eyes take in the skin and hair, you realize they are color photographs. LX: Looking at your work, one can see your vision is reflective of haute couture. Is fashion the foundation of your entire photographic approach? E.G. : I love coming up with a concept and gathering the right team around me to execute the vision and create a piece of art. I have a hard time expressing myself with words, but people can get to know me by just looking at my work. I like inspiring people with things they haven’t seen before. Fashion photography interests me because you have control over the outcome. Instead of waiting for a moment to happen, you create it. LX: How does that inform or affect your wedding work? E.G. : I make my wedding clients feel beautiful, glamorous, confident and ideally like they have a little fashion model in them as well. It’s their wedding day, they should experience it feeling exceptionally attractive. Within that, I also want to reflect their personalities. So while I try to glamorize the images as much as possible, I also make sure I capture the personalities of the subjects—along with the overall beauty and joyousness associated with the time. LX: With that said, how do you unobtrusively capture a wedding day? E.G. : When I’m photographing the couple or the wedding party for posed portraits, I relax everyone with humor. I let them see my dorky/goofy side. This humanizes the situation and loosens them up so rather than focusing on the camera, they relax and enjoy being in the moment. During the reception, I use my telephoto lens to photograph people from a distance so they don’t realize it because people tend to get a bit nervous when they know they’re being photographed. The act differently than they would normally. With these techniques, I can easily capture their love, fun and friendship. Meanwhile, they remain completely unaware I’m doing it. LX: What is the theme you were after with this shoot? How did that drive the choices of wardrobe, lighting, makeup and etc? We wanted a create an editorial/ commercial shoot that had elements of a fairy tale making it look like a piece of art rather than two models wearing gowns against a backdrop. We tried achieving this by using dramatic lighting, extravagant gowns, contoured makeup, flowing hair, a few added props, and models who could evoke emotion with their posing. Along with the fairy tale theme we wanted to incorporate the different cultural regions by using different Scandinavian and Mediterranean inspired gowns. 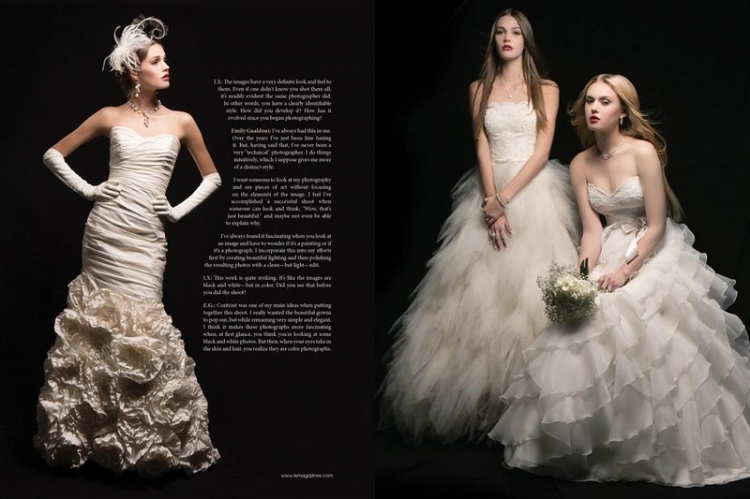 We wanted to show that some of the styles of the gowns were more structured while others were more ethereal and flowy. We wanted simple, straight hair to not distract from the dresses but added a fan to the hair in some of them to go along with the ethereal/flowy feel. LX: How are these images lit? They were shot on a black muslin backdrop so the black would be as rich as possible and wouldn’t reflect any kind of light. I used two very tall white boards on the left side to bounce a little light off from the strip box that was on the right side. They were positioned to maintain contrast. There was a strobe with barn doors placed behind the model on the left side to highlight the hair and create a nice separation between the model and backdrop. A beauty dish was overhead giving the overall face and upper body a dramatic and contoured effect. I used another strobe with an umbrella diffuser in the front aimed downwards to light up the details at the bottom of the dresses. LX: Please describe in detail the process you went through to create these images. Walk me through from the very first conversation about the assignment through all of the moving parts of conceptualizing with your stylist, makeup, wardrobe, hair and crew. Loni, the makeup artist originally contacted me about the project. She had previously worked with Jon on another project and once she heard that this one involved fashion/wedding photography she instantly thought of me. Typically the makeup artist usually doesn’t have too much input into what the models will be wearing but Loni was inspired by a European fashion show on TV that highlighted different wedding gowns from various cultural regions. She approached me with this and the ideas started flowing. Loni got in contact with the wardrobe stylist and expressed her inspiration to her. I have always been intrigued by photos that have an element of fantasy to them. I did some research and was inspired by a few other editorials online and really enjoyed the dramatic contrast between the white gown and dark background. The feathers added in some of the photos made to look like petals just give it a little bit more of fantasy feel. We then all met in person and tossed our ideas around and picked out the models together that we felt suited the shoot. The wardrobe stylist then went to the bridal boutique and kept what we had talked about in mind and picked the dress out. We felt like an art director was unnecessary because between the three of us we had a pretty clear idea and direction of what we wanted. LX: What did you see in these particular models that made them right for the shoot? My team and I really wanted women with long hair to create a dramatic fantasy effect along with strong facial features. We also wanted one of the girls to look more Scandinavian with blond hair and fair skin and the other to look more exotic and Mediterranean with darker features. LX: Describe your dream assignment. I love highly conceptualized shoots where there are no rules or boundaries and you can let your imagination run wild. Working with a full team of artists who are talented and have the same vision is also very important so you can bounce ideas each other and feed off one another’s energy. I would love to shoot a fashion editorial for Vogue and create not just a pretty picture but a visual masterpiece where every little detail was very well thought out and takes the viewer into another realm in their imagination. Creating visual fairy tales is my passion. Taking your vision and translating it to something that someone can physically hold and touch separates a true artist from an imposter. LX: Your dad gave you your first camera…was he a photographer too? What did he shoot? How did he encourage your career choice aside from placing the camera in your hands? My dad used to travel a lot overseas for fun and document his adventures. He really enjoyed taking pictures of the beautiful architecture and capturing the small moments with my mom. At home, my dad would photograph random subjects that he thought was interesting whether it was of their cat at the time, nature, landscapes or portraits. My dad actually received his masters in history but always found photography intriguing. Although photography was never his profession, he always kept his 35 mm readily available and once I expressed an interest in photography, he encouraged it and let me use it whenever I felt inspired. My parents have always been very emotionally supportive of my photography and has always encouraged me to follow my dreams. They always have and still take the time to listen to my excitement about every single shoot and view my work and give me constructive criticism. I have always known since second grade when I sat inside at recess to draw a photo that I wanted my life to be consumed with art. It wasn’t until I had access to a camera that I knew I wanted photography specifically to be my life. Here are some additional shots that didn’t make it to the magazine.